Sha'ban is one of the meritorious months for which we find some particular instructions in the Sunnah of Sayyidina Rasul-ullah (Sallaho Alaihe Wassallam) and he used to fast most of this month. 1 Our dear and beloved Nabi (Sallaho Alaihe Wassallam) used to fast the most (outside Ramadhaan) in the month of Sha'baan. 2 There are no authentic reports from Sayyidina Rasul-ullah (Sallaho Alaihe Wassallam) to specifically single out the night 15th of Shab’aan for worship, rather all of the reports have some weaknesses in them. a A group of Scholars state that together when these weak reports are combined they give some credence to this night that it has blessings and extra worship should be done in this night. See the opinions of Shaykh (Mufti) Taqi Usmani (HA) and the research and analysis of all Ahadeeth on the subject by Shaykh (Maulana) Fazlur Rahman Aa'zmi (HA) who is one of the foremost Hadeeth Scholars of our time, below. i It is then further stipulated that no specific acts of worship are defined and a person is free to perform any acts of worship (recitation of the Qur'aan, prayers etc.) but it must be done individually (and not collectively in Mosques). Cooking special meals, illuminating houses and Mosques, fireworks are all baseless innovations. b Another group of Scholars such as Shaykh (Mufti) Rasheed Ahmed Ludhyanwi (RA) in Ahsanul-Fatawa concludes that it is correct that in some instances "many weak Hadeeth" give credence to a matter but in this case the weakeness of narrations is so severe that even if we have in excess of a 1000 narrations it would make no difference and hence rejects any significance of this night. Shaykh (Mufti) Rasheed Ahmed Ludhyanwi (RA) in Ahsanul-Fatawa also produces the opinions of major Deobandi Ulamah to substantiate his Fatwa that there is nothing significant in this night. cShaykh (Maulana) Ashraf Ali Thanwi (RA) wrote that to send Isaal-e-Sawaab to the dead in this night is Sunnah in "Bahishti Zewar" and "Islahir-Rusoom". Shaykh (Maulana) Ashraf Ali Thanwi (RA) retracted this in "Imdadul-Fatawa" and said that "Islahir-Rusoom" shouldn't be printed without the correction. 3 There is no authentic report from Sayyidina Rasul-ullah (Sallaho Alaihe Wassallam) to visit the graveyard on the 15th or any other specific night (of this month), rather generally Muslims are encouraged to visit the graveyard (to remind them of death) and there is no connection of visiting the graveyard to the 15th (or any other) night of Sha'baan. 4 There is no authentic report from Sayyidina Rasul-ullah (Sallaho Alaihe Wassallam) to fast specifically and exclusively on the 15th of Sha'baan, hence this fast is neither Sunnah nor praiseworthy or recommended on its own. It has been previously stated that it was the noble practise of our dear and beloved Sayyidina Rasul-ullah (Sallaho Alaihe Wassallam) to fast frequently in this month so if 15th happens to fall during the days in which a person is fasting then that's fine but it cannot be singled out for fasting. 5 The opinion that destinies (births, deaths, marriages etc) are decided on this night (of the 15th of Shabaan) is without support and contradicts the Qur’aan and is therefore rejected by Scholars of Islam. 1 First: It is recommended to celebrate it collectively in the Masajid (Mosques). It is reported that Khalid ibn Ma'dan and Luqman ibn 'Amir and others used to put on their best clothes, apply incense and kohl (antimony powder eyeliner) and spend the entire night in the Masjid. Their act was approved by Ishaq ibn Rahawyah who said about celebrating it in congregation in the Masjid, that it is not Bid'ah. This is reported by Harb Al-Kirmany in his book titled: "Al-Masa'il" (Religious Issues). 2 Second: It is reprehensible to gather during that night in the Masjid for prayer, narrating stories and supplication, but is not reprehensible for one to pray individually during that night for himself. This is the opinion of Al-Awza'iy, who was the Imam of the people of Al-Sham, their jurist and their scholar, and this, Insha'a-Allah (if Allah wills), is the closest opinion to the truth, until he said: It is not known if Imam Ahmad said something about the Mid-Sha'ban night. There are two narrations reported from Al-Awza'iy regarding the recommendation to stay up late for prayer during the Mid-Sha'ban night relying on the two narrations reported from Imam Ahmad regarding staying up late for Prayer during the two nights of 'Eid. In one narration, he did not recommend staying up late in congregational prayer during the two nights of 'Eid because it was not reported from the Prophet (peace be upon him) or from his Companions that they did that. In another narration he recommended staying up late for Prayer during those nights following the act of 'Abdul-Rahman ibn Yazid ibn Al-Aswad who was one of the Tabi'un (Followers, the generation after the Companions of the Prophet), in that. By the same token, there is no sound and authentic narration reported from the Prophet (peace be upon him) nor from his Companions regarding staying up late for Prayer during the Mid-Sha'ban night. However, it is reported from a group of the Followers from among the noble jurists of the people of Al-Sham"
Sha'ban is one of the meritorious months for which we find some particular instructions in the Sunnah of Prophet Muhammad, Sall-Allahu alayhi wa sallam. It is reported in the authentic ahadith that Prophet Muhammad, Sall-Allahu alayhi wa sallam, used to fast most of the month in Sha'ban. These fasts were not obligatory on him but Sha'ban is the month immediately preceding the month of Ramadan. 1 The blessed companion Anas, Radi-Allahu anhu, reports that Prophet Muhammad, Sall-Allahu alayhi wa sallam, was asked, "Which fast is the most meritorious after the fasts of Ramadan?" He replied, "Fasts of Shaban in honor of Ramadan." 2 The blessed companion Usama ibn Zaid, Radi-Allahu anhu, reports that he asked Prophet Muhammad, Sall-Allahu alayhi wa sallam: "Messenger of Allah, I have seen you fasting in the month of Sha'ban so frequently that I have never seen you fasting in any other month." 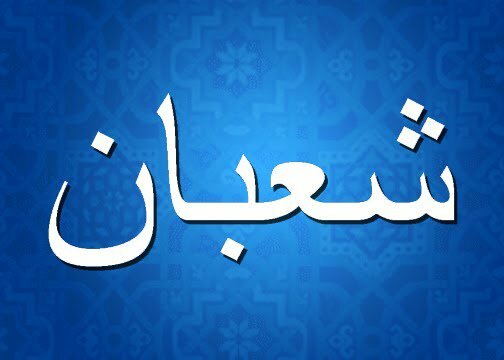 Prophet Muhammad, Sall-Allahu alayhi wa sallam, replied: "That (Sha'ban) is a month between Rajab and Ramadan which is neglected by many people. And it is a month in which an account of the deeds (of human beings) is presented before the Lord of the universe, so, I wish that my deeds be presented at a time when I am in a state of fasting." 3 Ummul Mu'mineen 'Aishah, Radi-Allahu anha, says, "Prophet Muhammad, Sall-Allahu alayhi wa sallam, used to fast the whole of Sha'ban. I said to him, 'Messenger of Allah, is Sha'ban your most favorite month for fasting?' He said, 'In this month Allah prescribes the list of the persons dying this year. Therefore, I like that my death comes when I am in a state of fasting." 4 In another Tradition she says, "Prophet Muhammad, Sall-Allahu alayhi wa sallam, would sometimes begin to fast continuously until we thought he would not stop fasting, and sometimes he used to stop fasting until we thought he would never fast. I never saw the Messenger of Allah, Sall-Allahu alayhi wa sallam, fasting a complete month, except the month of Ramadan, and I have never seen him fasting in a month more frequently than he did in Sha'ban." 5 In another report she says, "I never saw the Messenger of Allah, Sall-Allahu alayhi wa sallam, fasting in a month so profusely as he did in the month of Sha'ban. He used to fast in that month leaving only a few days, rather, he used to fast almost the whole of the month." 6 Ummul-Mu'mineen Umm Salamah, Radi-Allahu anha, says: "I have never seen the Messenger of Allah fasting for two months continuously except in the months of Sha'ban and Ramadan." 1 Ummul-Mu'mineen 'Aishah, Radi-Allahu anha, is reported to have said, "Once Prophet Muhammad, Sall-Allahu alayhi wa sallam, performed the Salah of the night (Tahajjud) and made a very long Sajdah until I feared that he had passed away. When I saw this, I rose (from my bed) and moved his thumb (to ascertain whether he is alive). The thumb moved, and I returned (to my place). Then I heard him saying in Sajdah: 'I seek refuge of Your forgiveness from Your punishment, and I seek refuge of Your pleasure from Your annoyance, and I seek Your refuge from Yourself. I cannot praise You as fully as You deserve. You are exactly as You have defined Yourself.' Thereafter, when he raised his head from Sajdah and finished his salah, he said to me: 'Aishah, did you think that the Prophet has betrayed you?' I said, 'No, O Prophet of Allah, but I was afraid that your soul has been taken away because your Sajdah was very long.' He asked me, 'Do you know which night is this?' I said, 'Allah and His Messenger know best.' He said, 'This is the night of the half of Sha'ban. Allah Almighty looks upon His slaves in this night and forgives those who seek forgiveness and bestows His mercy upon those who pray for mercy but keeps those who have malice (against a Muslim) as they were before, (and does not forgive them unless they relieve themselves from malice).'" 2 In another Tradition Sayyidah' Aishah, Radi-Allahu anha, has reported that Prophet Muhammad, Sall-Allahu alayhi wa sallam, has said, "Allah Almighty descends (in a manner He best knows it) in the night occurring in the middle of Sha'ban and forgives a large number of people more than the number of the fibers on the sheep of the tribe, Kalb." Kalb was a big tribe the members of which had a very large number of sheep. Therefore, the last sentence of the hadith indicates the big number of the people who are forgiven in this night by Allah Almighty. 3 In yet another Tradition, she has reported Prophet Muhammad, Sall-Allahu alayhi wa sallam, to have said, "This is the middle Night of Sha'ban. Allah frees in it a large number of the people from Fire, more than the number of the hair growing on the sheep of the tribe, Kalb. But He does not even look at a person who associates partners with Allah, or at a person who nourishes malice in his heart (against someone), or at a person who cuts off the ties of kinship, or at a man who leaves his clothes extending beyond his ankles (as a sign of pride), or at a person who disobeys his parents, or at a person who has a habit of drinking wine." 4 Sayyidna Mu'adh ibn Jabal, Radi-Allahu anhu, reports that Prophet Muhammad, Sall-Allahu alayhi wa sallam, has said: "Allah Almighty looks upon all those created by Him in the middle Night of Sha'ban and forgives all those created by Him, except the one who associates partners with Him or the one who has malice in his heart (against a Muslim)". 1 Salah. Salah is the most preferable act to be performed in this night. There is no particular number of Rak'at but preferably it should not be less than eight. It is also advisable that each part of the Salah like qiyam, rukoo' and sajdah should be longer than normal. The longest surahs of the Holy Qur'an one remembers by heart should be recited in the Salah of this night. If someone does not remember the long surahs, he can also recite several short surahs in one rak'ah. 2 Tilawa. The recitation of the Holy Qur'an is another form of worship, very beneficent in this night. After performing Salah, or at any other time, one should recite as much of the Holy Qur'an as he can. a One should recite Salah (durood) on Prophet Muhammad, Sall-Allahu alayhi wa sallam, as many times as he can. The dhikr can also be recited while walking, lying on bed and during other hours of work or leisure. 4 Dua. The best benefit one can draw from the blessings of this night is prayers and supplications. It is hoped that all the prayers in this night will be accepted by our Lord, insha-Allah. Prayer itself is an 'Ibadah, and Allah Almighty gives reward on each prayer along with the fulfillment of the supplicator's need. Even if the purpose prayed for is not achieved, one cannot be deprived of the reward of the prayer which is sometimes more precious than the mundane benefits one strives for. The prayers and supplications also strengthen one's relation with Allah Almighty, which is the main purpose of all kinds and forms of worship. a One can pray for whatever purpose he wishes. But the best supplications are the ones made by Prophet Muhammad, Sall-Allahu alayhi wa sallam. These are so comprehensive and all-encompassing prayers that all the human needs, of this world and the Hereafter, are fully covered in the eloquent expressions used in them. Actually, most of the prophetic prayers are so profound that human imagination can hardly match their greatness. b Several books in various languages are available which provide these prophetic prayers, and one should pray to Allah Almighty in accordance with them, whether by reciting their original Arabic text or by rendering their sense in one's own language. a To perform the Salah of Maghrib, 'Isha' and Fajr with Jama'ah in the mosque, or in their homes in case of their being sick. b They should keep reciting the dhikr, particularly the one mentioned in para (c) above, in whatever condition they are until they sleep. c They should pray to Allah for their forgiveness and for their other objectives. One can do so even when he is in his bed. d The women during their periods cannot perform salah, nor can they recite the Qur'an, but they can recite any dhikr, tasbeeh, durood sharif and can pray to Allah for whatever purpose they like in whatever language they wish. They can also recite the Arabic prayers mentioned in the Qur'an or in the hadith with the intention of supplication (and not with the intention of recitation). e According to a hadith, which is relatively less authentic, Prophet Muhammad, Sall-Allahu alayhi wa sallam, went in this night to the graveyard of Baqi' where he prayed for the Muslims buried there. On this basis, some of the fuqaha hold it as mustahabb (advisable) in this night to go to the graveyard of the Muslims and recite Fatihah or any other part of the Qur'an, and pray for the dead. But this act is neither obligatory nor should it be performed as regularly as an obligatory act. What Should Not be Done in This Night? 1 As mentioned earlier, the Night of Bara'ah is a night in which special blessings are directed towards the Muslims. Therefore, this night should be spent in total submission to Allah Almighty, and one should refrain from all those activities, which may displease Allah. Although it is always incumbent upon every Muslim to abstain from sins, yet this abstinence becomes all the more necessary in such nights, because committing sins in this night will amount to responding to divine blessings with disobedience and felony. Such an arrogant attitude can invite nothing but the wrath of Allah. Therefore, one should strictly abstain from all the sins, particularly from those mentioned in the Hadith No. 3 quoted earlier in this article, because these sins make one devoid of the blessings of this night. 2 In this night some people indulge in some activities which they regard as necessary for the celebration of the Night of Bara'ah, like cooking some special type of meal, or illuminating houses or mosques, or improvised structures. All such activities are not only baseless and innovated in the later days by ignorant people, but in some cases they are pure imitation of some rituals performed by non-Muslim communities. Such imitation in itself is a sin; performing it in a blessed night like the Night of Bara'ah makes it worse. Muslims should strictly abstain from all such activities. 3 Some people spend this night in holding religious meetings and delivering long speeches. Such activities are also not advisable, because these acts can easily be performed in other nights. This night requires one to devote himself for the pure acts of worship only. 4 The acts of worship like Salah, recitation of the Qur'an and dhikr should be performed in this night individually, not collectively. The Nafl Salah should not be performed in Jama'ah, nor should the Muslims arrange gatherings in the mosques in order to celebrate the night in a collective manner. Fast of the 15th Sha'ban being Mustahab? There is another question asked about fasting on the day following the Shab-e-bara'at. viz., the fifteenth of Sha'ban. It should be noted that among the entire collection f the Ahadith, one narrative is a weak one. On this account some Ulama do not regard it an act of Sunnah or even a Mustahab (desirable) act to fast on the fifteenth Shabaan. It is, however, proved that it is an act of excellence to observe fasting during the period from the first to the twenty-seventh of Sha'ban. The Holy Prophet (Sallallaho Alaihe Wassallam) has forbidden to fast on the 28th and 29th days of Shabaan, so that a man may remain well prepared and energetic for fasting in the month of Ramazan. it is, however, meritorious to observe fast on days in the period from the first to the twenth-seventh day of Shabaan. Moreoever, this fifteenth day of Sha'ban is one of the three days of Ayyam Beez (the white days). i.e. the 13th. 14th and 15th of each month. The Holy Prophet (Sallallaho Alaihe Wassallam) used to observe fasts frequently on these three days. If a man fasts on the 15th day of Shabaan because firstly it is a day of the month of Shabaan and secondly because this day is one of the three days of Ayyam Beez (the white days), he will, God willing, be granted recompense for his fasting. It is, however, not right, in the opinion of some Ulama. to regard fasting on this day as Sunnah, only because it is a day of the month of Shabaan. While mentioning the Mustahab (desirable) days of fasting, most Ulama have included for fasting the 10th of Muharram and the day of Arafah, but they have not said anything separately about fasting on the 15th of Shahan. All that they have said is that it is meritorious to fast on any day in the month of Sha'ban. If anyone observes fast on this day from this angle of vision he will be entitled to reward. Except for this, no other day has any importance. The blessed companion Anas, Radi-Allahu anhu, reports that Prophet Muhammad, Sall-Allahu alayhi wa sallam, was asked, "Which fast is the most meritorious after the fasts of Ramadan?" He replied, "Fasts of Shaban in honor of Ramadan."